Jack Davis is one of the finest cartoonists, illustrators, and caricaturists of the 20th century. His work is popularized around the world as it has been seen in popular magazines, print ads, and other commercial illustrative work for a laundry list of companies. 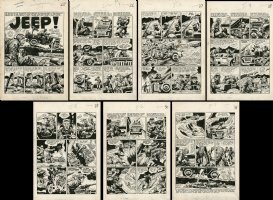 Jack Davis' flexibility in capturing the essence of any subject within his artboard is extraordinary. Mad - Baseball... Science Or Skill? Two Fisted Tales - Jeep - Complete 7 Page Story! Vault Of Horror w/The Vault Keeper!